The past is the future in this week’s season finale of 12 Monkeys. 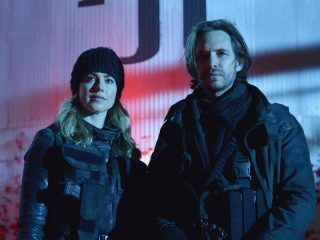 Syfy’s time-travel drama has had a mind-blowing second season, resolving the virus storyline only to blow out the show’s mythology with new threats — not only to the survival of the human race but to the very fabric of time itself. 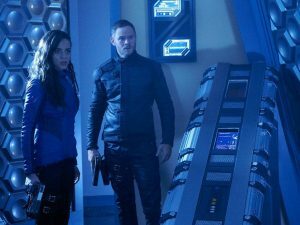 Also this week: Syfy Channel’s summer Friday night block continues with new episodes of Killjoys and Dark Matter. First Dutch’s team encounter the mystery of missing children when they visit a Westerley school for the gifted. Then on Dark Matter, Three is confronted with another piece of his past. As one show draws to a close we’re also keeping tabs on what’s coming up later this summer. August will see the return of AMC’s Fear the Walking Dead, with Season Two picking up where it left off on Sunday, August _ (9/8c). 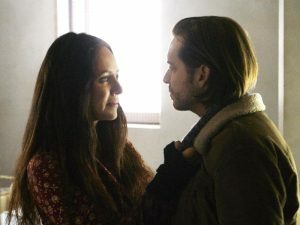 “Memory of Tomorrow.” As Cole and Railly try to find peace living in the past, they encounter a mysterious woman with apocalyptic visions of the future, who tells Cole that his work isn’t done and he must do the unthinkable to save the world. “Schooled.” The team discovers that students have mysteriously disappeared from a school for gifted children on Westerly. “We Were Family.” While Three’s past becomes present, the Android encounters a game-changing entity. What is YOUR top pick for this week?